You don’t need me to tell you that the pace of disruption and change in business is already immense and is accelerating. 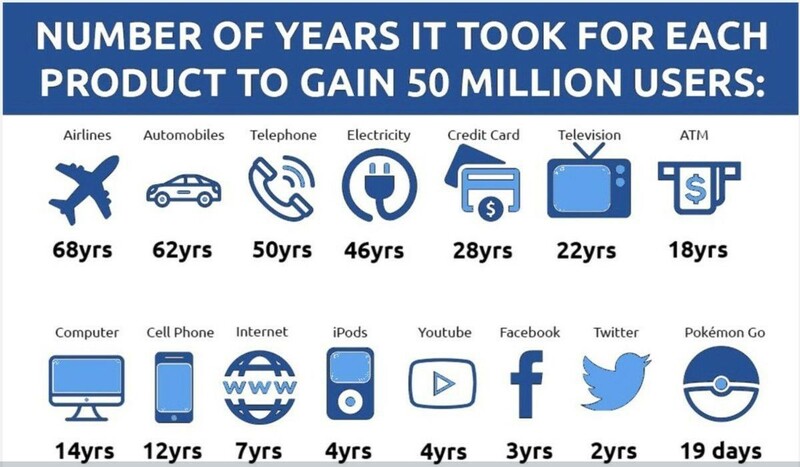 The Wall Street Journal several years ago published an interesting comparison of how long it takes for a new product to reach 50 million users. This pace of change is forcing everyone to rethink the way they get work done, and this can lead to culture clashes in your organization. Digital disruption is a wake-up call for all companies, requiring bold new strategies and investments. Some internal groups may see this as an opportunity to drive a bimodal IT and process agenda, avoiding existing, controlled processes in favor of more agile ways of working focused on exploration, experimentation, and innovation. Other groups may become entrenched in traditional planning processes and operational mindsets and want to slow everything down. Old competitors are dropping, and new competitors are springing to life. It leaves me to wonder: how do you decide when to go fast and when to slow down? How do you avoid creating new silos and an „us versus them“ mentality? And how does this all come back together in the end? Let’s take a closer look at how business architecture can help drive better decision making around setting the pace for change in your organization, in three key areas: organizational readiness, operating model, and re-tooling your business architecture practice itself. New skillsets may require new people. And don’t settle during the interview process. Take the time to find the right candidate, or you will have a new problem in the future that you need to deal with. Business architects can help by clearly establishing the current and target state for resources and help to articulate the timeline needed for this change. This can then be used to help establish the workforce plan. Ensure the vision and strategy is clear. All the talent in the world isn’t going to fix an ambiguous direction. Also ensure it is clear how the new direction fits, or doesn’t, with the traditional business model. An org chart that is in a constant state of flux impacts execution. Help your leadership to understand how org changes may impact timelines. Operating Model – The desired level of business process integration and business process standardization for delivering goods and services to customers. If your company has established process governance for those processes it has decided to standardize, how does this impact the stand-up of new capabilities? Existing business processes were likely developed for the business model of the past, based on that model’s requirements for managing risk and driving cost efficiencies. Rolling out a new digital capability, however, will likely have very different requirements. Forcing your new venture to live under existing rules may give it a disadvantage in the marketplace. However, letting the new venture do whatever it wants has its own risks and may result in a new shadow organization with higher costs and organizational conflict. Business architects can play a key role in raising awareness of these issues. Facilitating discussions between business process groups, digital leaders, IT, and other groups and functions can help to ensure that at least there is a well-vetted plan for how the existing operating model will need to change to accommodate new business models. How many of your architecture processes are still on a fixed schedule? For example, updating a capability model annually, producing architecture artifacts only in alignment with a strategic planning cycle, etc. Business architecture work needs to become real time, triggered by real changes in the business. Update your capability models as capabilities change. Constantly scan external markets for potential impacts and analyze them to get ahead. Right-size your governance processes. If this all seems too difficult and time consuming, that calls out the need to automate your processes. How often do you find yourself saying, „that’s not my job“? In the past, some architects kept their focus narrow to only their discipline. (I once went to a project meeting where the number of architects in the room (business, enterprise, data, solution, etc. exceeded the size of the rest of the group!) The breadth of knowledge required by a business architect continues to grow, so ensure you are continuously developing yourself so that you can adequately speak cross-discipline. Ensure you have at least some connection to each of the various functions in your organization and some means to stay in tune with what is going on. It is hard to help set the pace if some part of your organization has already done it! Just as a pace car is used in an auto race to warm up the field, release the field at a purposeful speed to start the race, and to ensure safety during caution periods, business architecture can play a similar role in providing guidance to business leadership on speed of change. Helping to guide the pace of change in your company is a key and critical role you can play as a business architect. Work with your business leaders to develop principles to help guide decision making around when to move fast and when to slow down. And perhaps most importantly, communicate the „why“ behind the decisions once they are made to limit misunderstanding and garner support. Vorheriger BeitragSchon wieder New Work? Jetzt aber mal Klartext! Nächster BeitragI’m not 53. I’m 21 with 32 years experience!